The IHRC (former-Wabash) office at Defiance, Ohio, where I was based during my employment with Indiana Hi-Rail. Photo from 28 November 1989. Our professional working lives on the railroad all have their starting points. Mine was in Connersville, Indiana. Having graduated from the University of Michigan in May 1989, I continued to work at the university hospital, where I’d been working during the last years of my studies. With a degree in hand, however, I was ready to move into the railroad world. Using a copy of the Official Railway Guide, which listed names, addresses and officials of various railway companies throughout the USA, I mailed about 100 copies of my resume to railroads big and small around the country, and sat back to wait for replies. About 10% of the resumes received an actual reply in the mail, usually of the “we’re not looking for any new help currently” variety. The rest went unanswered. However, in August I received a letter from the Indiana Hi-Rail Corporation, informing me that they were planning to expand, and inviting me for an interview. A railfan friend of mine had recently passed through Connersville and rated IHRC as a “progressive operation”, so my hopes were high. A week later I drove from Michigan down to Connersville one afternoon, stayed the night at a local hotel, and the next day entered the IHRC’s “world headquarters”, which was a rather new, purpose-built building on the north side of town. I had a long meeting with David Booker, who was a vice president handling computer systems and administrative functions, and then with R. Powell Felix, IHRC’s president. I found out that IHRC would shortly be taking over a number of branch lines from Norfolk Southern Corporation in northern Indiana and Ohio, and would be setting up a new division to run these, based in Defiance, Ohio. The interview went well, and a week or two after returning home I received a letter with the offer of a job as office manager at Defiance, Ohio. I was officially a railroad employee! I was report to Connersville for training starting 02 October, so I resigned my job at the University and started planning for a move. Upon arrival at Connersville, I was put up in a motel across from the IHRC offices and started to learn the new computer system being implemented by IHRC, IRCS (Integrated Railcar Control System) from Railcar Management (where David Booker had been recruited from). I was also given a change to observe various aspects of how a short line railroad worked. One day I rode the local train up to New Castle, IN and return, even being given a chance to run locomotive GP-35 #371 (ex-DT&I!) on the return trip. Another day was spent with the track crew installing ties, and yet another with the car department, where I learned to change brake shoes on freight cars. Every day there was something new. After a week at Connersville, much of the time spent entering switch lists into IRCS, the news came that the start-up of operations at Defiance would be delayed for a while. 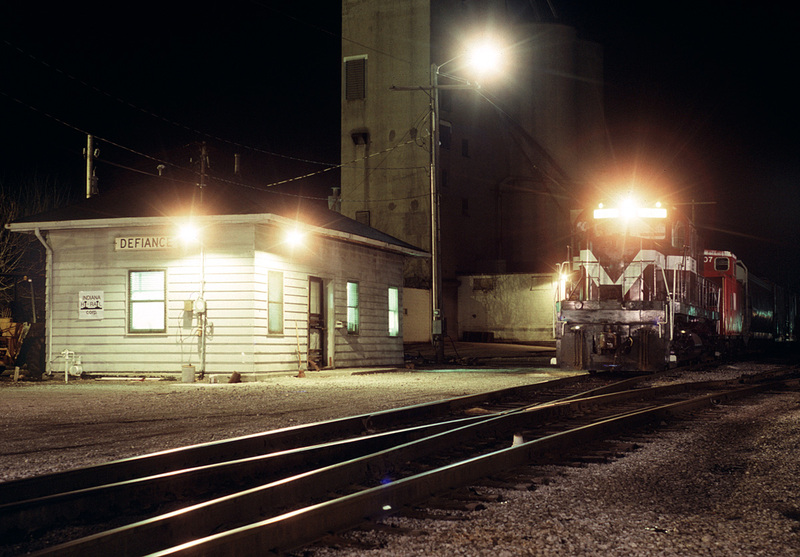 With not much for me to do in Connersville, and a lot of working needing to be done on the IHRC division at Evansville, IN, where the unit grain train season was beginning, I was sent off on delegation there to help out, and to meet some of the people I’d be working with.